Aristo has released a snow plow car based on a prototype that ran on the Milwaukee railroad but similar cars were used on many other roads. These were typically shop built cars so every one was a little different. Some had superstructures with a cab to allow an operator to manage the plow blade, some were much simpler, like this car. 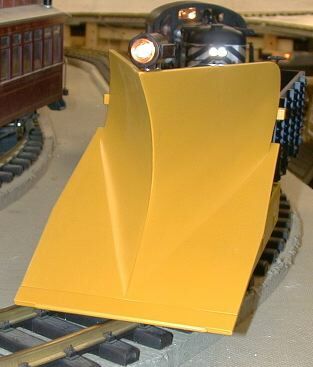 It was just filled with rock ballast and rammed into snow banks to clear the track. The model is apparently based on a Delton Classic gondola with the front 25% of the carbody removed and replaced with a plow blade. The trucks are of the archbar design and are sprung. There is one standard Aristo truck mounted coupler. 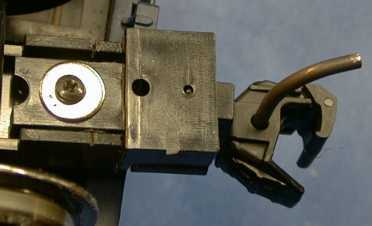 There is a hook and loop coupler supplied in the box. The very tip of the blade can be adjusted upward and downward a little to allow the blade to clear vertical gradients in the track. I don't have any snow here now, and I'm not likely to get any soon (like in the rest of my lifetime) so I'll have to defer judgement on how well it clears snow to others. I can attest that it does sweep leaves and twigs off the track. The car has an operating headlight that picks up power from all eight ball bearing wheels. Power pickup on very dirty track is good. When the car is rammed into a snow bank, its truck mounted coupler will put twisting forces on the truck and I was concerned that the car would derail. Not having any snow to test it with, I just loaded it with a single brick and ran it in front of an FA at full tilt into a 4' radius curve and stopped it dead with my hand. The car didn't derail, but the FA did every time. I turned the engine around to push with the rear coupler and then the FA didn't derail either. The locomotive derailment seems have something to do with the front coupler mounting geometry. An RS-3 pushing didn't derail from either end, neither did a USA Trains GP-9. It will take a healthy loco, or maybe several, to mash through real snow. A consist can probably be found that can take the bashing without derailing. The car itself didn't derail during any of this bashing except for the one time that I knocked the whole consist over. At the GIRR Mountain Division, I reran the derailment tests with a Shay or an Aristo Center Cab pushing on 2' radius curves. There were no derailment problems so I suppose that the truck mounted coupler will work ok. This car comes equipped with ball bearing wheelsets with integral power pickups. Due to the ball bearing wheels, I expected that the car would roll more freely than a standard car. This is not necessarily true. These wheels have more drag than a well conditioned standard wheelset without a power pickup. However, as compared to any brush type power pickup, the wheel drag is much lower. Also, since the car is intended to be filled with rocks (or maybe batteries) to have sufficient weight to bash through real snowdrifts, the ball bearing wheels are necessary as ordinary plastic wheel journals would wear out in a very short time. I don't have any experience with other ball bearing wheels so I don't know other wheels roll better or not. However, these wheelsets don't cost $7 an axle either. They would be a good candidate for replace on cars and tenders with brush power pickups. The car faired poorly in initial roll tests against several other friction bearing cars. 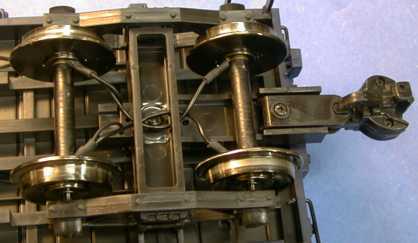 The bearing drag is higher than the axle drag on a standard car. The bearings are not sealed so that a little LGB 50019 oil in both sides of the bearings helped a lot but it still didn't roll as well as the other cars. The axles are pressed into the truck sideframes and are not allowed to rotate or slide sideways. I found that equalizing the spacing between the wheels and the truck frames tended to make the trucks run straighter and that helped a little. When the "standard" cars and the snowplow were loaded with the weight of an ordinary brick, the standard cars slowed considerably on the grade due to the increased bearing friction. The snowplow however, rolled better that it did before. The added drag of the bearings under load is small enough so that the extra weight allowed it to roll better down my test grade (1.6%) than it rolled with no load. Loaded, it also rolled better than the standard cars with no load. Aristo claims that the car should roll better than it does and maybe I have some tight wheelsets. In any event, it doesn't matter much. The car rolls better than a car with standard wheels when weighted into operating trim and it is clearly much better than cars with brush type power pickups. Since this car appears to be made from a Delton Classic car, its scale would be 1:24. Wooden gondolas were made in many sizes so it could fit most anywhere. The archbar trucks were banned from interchange service early in the 20th century but were allowed on MOW cars as long as they would run. The plow blade itself is 4-3/4" wide and this is probably the widest, lowest car that anybody has ever run. The first run around should be done dead slow to find trackside objects that will catch the blade. 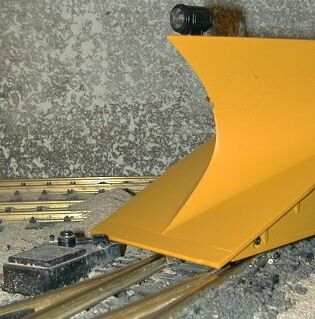 On 4' radius track, the plow blade overhangs by 2" from the outside rail. On 2' radius curves, the blade overhangs the outside rail by 3" so that the clearance issues might be serious. This is 1/2" more than a Bachmann Big Hauler overhangs. On the tight turns, the inside corner of the blade just hovers over the rail head so that it will marginally clear snow on tight turns. The plow blade will interfere with Aristo turnout motors in a particular track geometry. 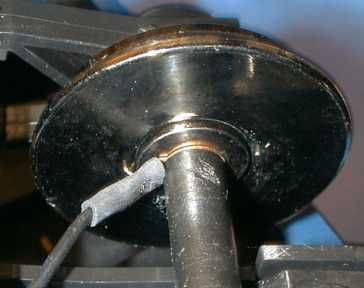 When the motor immediately follows a tight radius curve and the motor is on the outside the blade will solidly whack it. The interference is so severe even with the blade lifted to its highest position. There doesn't seem to be a fix for this except to change out the Aristo motor for an LGB motor which is fairly easy to do, see my Aristo Turnout Tune up page for details. The stock Aristo coupler can be changed out for a Kadee #831 coupler with a little gouging on both the coupler mount and the coupler box. 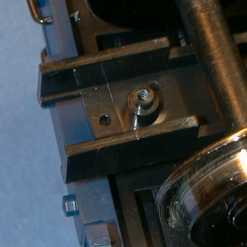 The two wings that stick out to the sides of standard mount need to be cut off flush with the bottom of the coupler mount. The Kadee #831 will fit if the two little bumps on the side of the box are ground off and the mounting hole of the coupler box is opened to 1/4". The modified Kadee then mounts with the original screw and a junk box washer. The Kadee comes out at exactly the right height. This page has been accessed times since 14 July 00.